That's the finding of a geophysical team from Southern Methodist University, Dallas that previously reported the rapid rate at which the sinkholes are expanding and new ones forming. Radar satellite images show significant movement of the ground across a 4000-square-mile area—in one place as much as 40 inches over the past two-and-a-half years, say the geophysicists. "The ground movement we're seeing is not normal. The ground doesn't typically do this without some cause," said geophysicist Zhong Lu, a professor in the Roy M. Huffington Department of Earth Sciences at SMU and a global expert in satellite radar imagery analysis. "These hazards represent a danger to residents, roads, railroads, levees, dams, and oil and gas pipelines, as well as potential pollution of ground water," Lu said. "Proactive, continuous detailed monitoring from space is critical to secure the safety of people and property." The scientists made the discovery with analysis of medium-resolution (15 feet to 65 feet) radar imagery taken between November 2014 and April 2017. The images cover portions of four oil-patch counties where there's heavy production of hydrocarbons from the oil-rich West Texas Permian Basin. The imagery, coupled with oil-well production data from the Texas Railroad Commission, suggests the area's unstable ground is associated with decades of oil activity and its effect on rocks below the surface of the earth. The SMU researchers caution that ground movement may extend beyond what radar observed in the four-county area. The entire region is highly vulnerable to human activity due to its geology—water-soluble salt and limestone formations, and shale formations. "Our analysis looked at just this 4000-square-mile area," said study co-author and research scientist Jin-Woo Kim, a research scientist in the SMU Department of Earth Sciences. "We're fairly certain that when we look further, and we are, that we'll find there's ground movement even beyond that," Kim said. "This region of Texas has been punctured like a pin cushion with oil wells and injection wells since the 1940s and our findings associate that activity with ground movement." 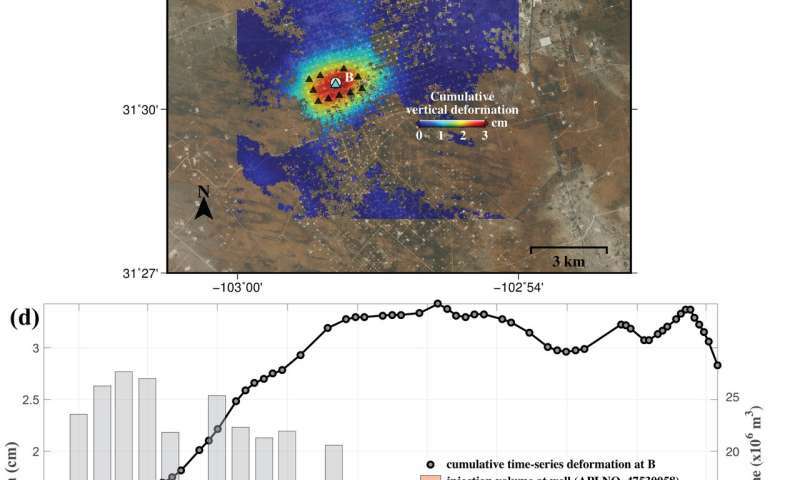 Lu, Shuler-Foscue Chair at SMU, and Kim reported their findings in the Nature publication Scientific Reports, in the article "Association between localized geohazards in West Texas and human activities, recognized by Sentinel-1A/B satellite radar imagery." With interferometric synthetic aperture radar, or InSAR for short, the satellites allow scientists to detect changes that aren't visible to the naked eye and that might otherwise go undetected. 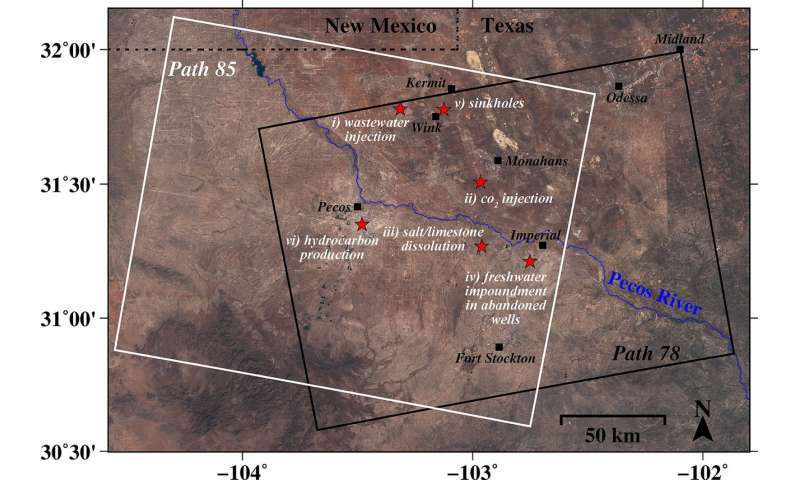 The SMU researchers found a significant relationship between ground movement and oil activities that include pressurized fluid injection into the region's geologically unstable rock formations. Also related to the ground's sinking and upheaval are dissolving salt formations due to freshwater leaking into abandoned underground oil facilities, as well as the extraction of oil. Water there has leaked into the easily dissolved Salado formation, created voids, and caused the ground to sink and water to rise from the subsurface, including creating Boehmer Lake, which didn't exist before 2003. "Movements around the roads and oil facilities to the southwest of Imperial, Texas, should be thoroughly monitored to mitigate potential catastrophes," the researchers write in the study. "We have seen a surge of seismic activity around Pecos in the last five to six years. Before 2012, earthquakes had not been recorded there. At the same time, our results clearly indicate that ground deformation near Pecos is occurring," Kim said. "Although earthquakes and surface subsidence could be coincidence, we cannot exclude the possibility that these earthquakes were induced by hydrocarbon production activities." "This is necessary to learn the cause of recent increased seismic activity," Kim said. "Our efforts to continuously monitor West Texas with this advanced satellite technique can help sustain safe, ongoing oil production." InSAR accesses a series of images captured by a read-out radar instrument mounted on the orbiting satellite Sentinel-1A/B. The satellites orbit 435 miles above the Earth's surface. Sentinel-1A was launched in 2014 and Sentinel-1B in 2016 as part of the European Union's Copernicus program. The Sentinel-1A/B constellation bounces a radar signal off the earth, then records the signal as it bounces back, delivering measurements. The measurements allow geophysicists to determine the distance from the satellite to the ground, revealing how features on the Earth's surface change over time. "Near real-time monitoring of ground deformation at high spatial and temporal resolutions is possible in a few years, using multiple satellites such as Sentinel-1A/B, NISAR and others," said Lu. "This will revolutionize our capability to characterize human-induced and natural hazards, and reduce their damage to humanity, infrastructure and the energy industry." - "Proactive, continuous detailed monitoring from space.."
- "Active, continuous detailed monitoring from space..."
- "Continuous detailed monitoring from space..."
That pet-peeve aside: Drilling and fracking...the gift that keeps on giving. The ground sags? So fricking what? Better that than the oil prices the Ruling Establishment and Elite would have us pay. Have you hugged a fracker today? You should. Sinkholes and ground movement happen all the time for one reason or another. In Florida, a sinkhole happened below a guy's bedroom and sucked him and his bed down, never to be found again. Weird stuff. Sounds like a movie to me. Yeah. Hug'em. Pin 'em down, so that they can't move and cause any more damage. So do car wrecks, planes crashes and typhoid breakouts. You think we should just ignore it? Shootist: So fricking what? Better that than the oil prices the Ruling Establishment and Elite would have us pay. Who do you think we're paying now? The oil fairies? Take your meds, dude. Sinkholes in FL are natural, due to an underlying layer of limestone that gets dissolved by groundwater. The sinkholes in this article are due to mineral extraction activities. Shootist: The ground sags? So fricking what? Matters if you are a surface property owner getting your land trashed. Better that than the oil prices the Ruling Establishment and Elite would have us pay. Your mean prices that include what are now externalized costs for mineral extraction interests? Things like subsidence, earthquakes, air pollution health costs, climate change and environmental cleanups/disasters; costs that get foisted on others as these industries make their money and run?? Why have the scientists not used satellite radar interferometry? This should be much more sensitive than the visual method they are currently using. There are several government agencies which have these capabilities. So how does this compare with areas around the new madrid fault, san andreas, Bakken field, Scandinavian peninsula, etc. Sounds like a big, So What. Typically water at and above the same level as gas and oil is saline. So what! Have you ever driven through the Permian? Don't worry be happy, no one will notice if it disappears. We referred to it as miles of miles and miles. Just hope your oil wells your sucking dry don't come from underground caverns that cover appreciable areas of your country as they keep on growing eternally! Or after filling the air with all those noxious fumes you might not have a country to run the emitting culprits on, you're SUVs! The Gobi deserts are renowned for Quick Sand! The Oil Sheiks are undermining large areas of their desert. Why isn't Saudi Arabia one gigantic sink hole? Proactive, continuous detailed monitoring from space.."
-Monitoring in anticipation of a problem. "Active, continuous detailed monitoring from space..."
- Active, continuous monitoring of an actual problem. Continuous detailed monitoring from space..."
-Continuous detailed monitoring of an actual problem. 'Active' could indicate a certain level of scrutiny. Perhaps your translator is on the fritz -? The whole state's going to hell.... some parts a little faster than others. Maybe because the Gobi Desert is in China? Anonym: The whole state's going to hell..
Turgent: So how does this compare with areas around the new madrid fault, san andreas, Bakken field, Scandinavian peninsula, etc. Those are all natural fault zones (except for the Bakken Formation which appears to be an active oil/gas production area.) Quakes have been found to be caused by extraction operations, especially the injection of fracking waste water into wells. One can't do much about naturally occurring quakes, but human caused trigger factors are certainly valid subjects for policy and regulation. Sounds like a big, So What. Matters if valuable infrastructure is above a sinkhole, as noted in the article. Have you ever driven through the Permian? In what, a time machine? Don't worry be happy, no one will notice if it disappears. We referred to it as miles of miles and miles. Ohhh, the Permian Basin in TX! There still are likely things which can be damaged/polluted. @Turgid "Typically water at and above the same level as gas and oil is saline. So what!" $20 billion a year in food and fiber depend on the aquifer." "The water-saturated thickness of the Ogallala Formation ranges from a few feet to more than 1,000 feet (300 m) and is generally greater in the Northern Plains. The depth of the water below the surface of the land ranges from almost 400 feet (120 m) in parts of the north to between 100 and 200 feet (30 and 61 m) throughout much of the south." Fracking wells are being drilled through it every day. My point is only that other locations move up and down at comparable rates. Kern county, CA, areas where massive and non-replenishing groundwater is pumped out of like the Nebraska's Ogallalla aquifer, etc. Such limited movement over these time frames doesn't appear to create problems. If you if have to give 70 acres of range in the Permian per head of cattle then the area isn't to exciting. It isn't even good for fossil hunting. Oh the Texas Railroads Commission, oil and gas regulator, is as good as it gets. About 1,000,000 wells have been drilled in Texas and there ain't no pollution from 100 years of drilling. Huge numbers of vertical wells have been fracked long ago there. Texas is a good steward of its land. Dude, go to google earth. See the huge crop circles. They are hugely concentrated. The Og drops ft per year. There are places in the world where salt has invaded the fresh due to over pumping. The fracking wells in the Marcellus go through thick salt layers. No problem yet. In Watkins Glen NY salt has been mined by forced hot water under lake Seneca for over 70 years, no problem. Different places different circumstances different geology. This isn't to poo poo all that their saying. There should have been evidence of problems long ago. I don't need to go to Google Earth. I live there. My family still farms. antialias_physorg:- Maybe because the Gobi Desert is in China? Erm..whut? I know you're from the US (no one else in the world could be that ignorant of geography)...but...seriously, dude? Sheiks are in the middle east. The Gobi desert is in China. Yeah, they're on the same continent, but that's about as far as it goes. There's more than 5000km between them. Some time ago we used to go to Enders Lake near Imperial, NE. https://www.googl...!3m1!1e3 talks about land subsidence due to water depletion and concerns about salt water intrusion. It would appear the huge threat to aquifers is extraction far more than anything else. "Fluid injection includes waste saltwater injection into nearby wells, and carbon dioxide flooding of depleting reservoirs to stimulate oil recovery." The waste salt water is what is brought to the surface by fracking and the CO2 basically makes it a fizzy. It appears geography's everyone's strong point, only 3000 miles across the pond old bean, It's probably why the sink holes are appearing on land because of the water and not the desert; it takes wet agitated sand to create quicksand so as long as the sheiks don't pour water on their desert there probably safe But don't just take my word for it, put your threepence worth in the pot! antialias_physorg:- Erm..whut? I know you're from the US (no one else in the world could be that ignorant of geography)...but...seriously, dude? if these sinkholes are due to oil well subraction subsidence holes in texas causing visible land movement, the same movement has to observed over the desert. Unless the oil wells are under the sea where they can fill with seawater.